Dental caries or dental caries is an extremely common yet preventable oral disease. Clinically, dental decay can be partly reversed, if it is diagnosed and treated in its early stages. Dental decay induces damage to the teeth that cause cavity formation of the affected teeth. Many factors can influence cavity formation, including the status of oral hygiene, and frequent consumption of sugary drinks. Anyone who has teeth can develop dental decay or formation of holes in the teeth; usually, it is more common for children and young adults. Structurally tooth has three layers, the outer hard layer (enamel), the middle layer (dentin) and the center of the tooth (pulp), which contains nerves and blood vessels. If dental decay is not properly treated, the cavity can get bigger in size to damage the deeper parts of the teeth, causing a severe toothache, infection and even tooth loss. Fig. 1. Schematic diagram of a tooth with cavity formation. 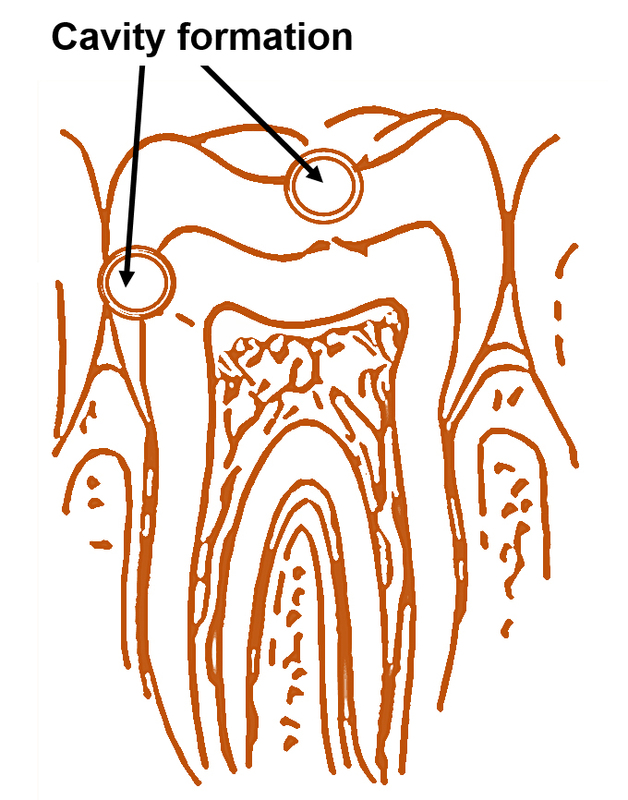 Please note that cavity can be formed in different parts of the tooth, as depicted by the arrows. An association between excessive sugar consumption and dental decay, particularly in children, has been well-established. Of relevance, sugary drinks (also known as soft drinks, soda pop, and carbonated beverages) are routinely consumed by 20% of the U.S. population. In this publication, we have analyzed whether consumption of phosphorus, an important ingredient of sugary drinks, has any association with the evolvement of dental decay. In the United States, the recommended dietary allowance (RDA) of phosphorus is 1,250 mg per day for children between the ages of 9-18 years, and 700 mg per day for adults and the elderly. In a recent study, 35% of the US adult population was found to consume more than double the amount of phosphorus than recommended. A Greek study of children aged 2-14 years (n=1936) found that over half of the children consumed more than 1,500 mg of phosphorus per day. The adverse effects of consuming such high levels of phosphorus are not yet extensively explored. In our recent publication, analyzing more than 8000 school-aged children, we have shown an association between the dietary consumption of phosphorus (calorie-adjusted) and the development of dental decay. More importantly, our analyzed results showed a significantly high percentage of dental decay in children who consumed a diet, low in sugar but high in phosphorus (7%, n=661), compared to those who consumed a low sugar and low phosphorus containing diet (5%, n=413), clearly suggesting that high phosphorus intake alone can promote dental decay, even when sugar intake is low. Although both high sugar and high phosphorus consumption can promote occurrence of dental decay, conditioned on all the covariates, for 1 unit increase in calorie-adjusted sugar intake, the odds of having any dental decay increased by 12% (p = 0.044), and for 1 unit increase in phosphorus, the odds of having any dental decay increased by 33% (p = 0.008). Further studies will explain the underlying molecular mechanism of how increased phosphorus consumption promotes dental decay. In this context, however, it should be noted that studies have found a negative association between high phosphorus and bone density, as phosphorus consumption can reduce bone formation and increase bone resorption, and thereby making the bone functionally weak. From our results, we conclude that high consumption of either sugar or phosphorus can increase dental decay, and that, unrestricted consumption of phosphorus -containing soda drinks and other phosphorus-rich foods can promote the occurrence of dental decay, even in children with low sugar consumption. The results of our study emphasize the need for an educational initiative to raise awareness of the dental risks posed by excessive consumption of phosphorus-containing food & drinks. Finally, the results of this study might explain why some patients, despite consuming low sugar diet, yet found to be affected by dental decay. Dietary phosphorus burden increases cariogenesis independent of vitamin D uptake.